Successfully Added 3.5 inch HDD Network Attached Storage Enclosure to your Shopping Cart. For anytime backup or simply sharing files without the need to have a host computer on, a 3.5 inch HDD Network Attached Storage enclosure is the perfect solution. With support for multiple serving protocols this unit can be used locally within your network as a simple add on storage device or remotely over the internet as an excellent off-site backup tool. This enclosure also supports USB so when the need arises it can also be used as a simple USB drive, handy for carrying large amounts of data. Buy today and integrate this into your home or business network, or purchase a few and start selling them on for great profits. Supported Serving Protocols: TCP/IP, NBNS (Net BIOS Name Server), Microsoft Networks(CIFS/SMB), DHCP Client, SNTP Client. 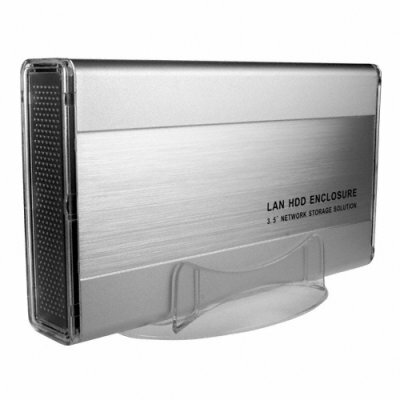 -LAN access: Windows 98SE/ME/NT4.0/2000/XP/2003/Vista, Mac OS X (10.3 or above versions) , Linux and Unix (SMB/FTP). -USB access: Windows ME/2000/XP/2003/Vista, Mac OS 8.6/9.x/10.x and Linux kernel after 2.4.1.0.